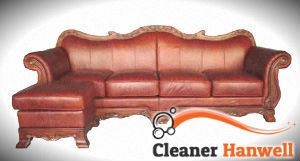 As the time passes, dirt and grime accumulate onto your leather sofa and in order to restore its good condition, you have to consider booking a professional leather sofa cleaning service. If you are based in Hanwell, we will be happy to help. Speaking of the leather sofa cleaning procedure in particular, our cleaners will take several consecutive steps, aimed at making the leather sofa look like a brand new one. First, they will apply a special detergent that lifts the accumulated dirt. When the cleaning agent is wiped down, the leather is heated and moisturiser is applied. Optionally, a protector that fills the cracks can be applied as the cracks are the areas where the most part of dirt and grime settles. Get in touch with our operators at your earliest convenience and ask all additional questions regarding the leather sofa cleaning procedure. 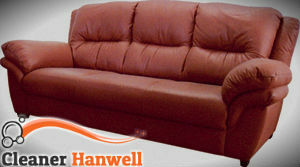 We cover Hanwell and the other London areas and we operate seven days a week, including the official bank holidays. The sooner you call, the higher the chances of booking a convenient to you time slot are.